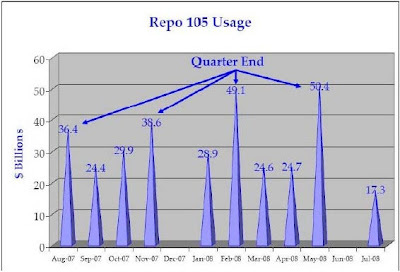 AlphaNinja: Lehman's quarter-end "Repo 105" transactions, just the tip of the iceberg. 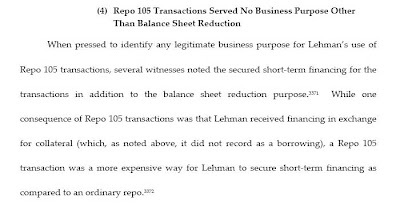 Lehman's quarter-end "Repo 105" transactions, just the tip of the iceberg. MUCH is going to be written in the days and weeks ahead about how the repo market helped Lehman pull the wool over examiners eyes by jettisoning assets at quarter-end to make their capital levels look healthier. In the simplest terms, this would be like a college student paying his neighbor to hide his bong during room inspections. In the excellent bankruptcy analysis produced by examiner Anton Valukas, he takes Lehman to task for their illegal use of the repo market to boost capital levels at quarter end, to give the impression of better capital and risk ratios. Quick and dirty explanation - The repo (repurchase) agreement market is a way for firms to get cash in exchange for collateral. This cash if critical for financial firms that do not have access to a more stable source of capital like bank deposits. Per the chart below, Lehman would pledge collateral in exchange for cash. The quality of that collateral would determine how much cash it would get in return. For instance, if the collateral was of very high quality, they might post collateral of $102 in exchange for $100 in cash. The $2 difference being the "haircut" due to the risk of the collateral's valuation being wrong. 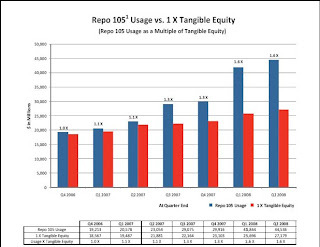 Lehman's program's were called "Repo 105 and Repo 108," due to the poor quality of the assets posted as collateral. Meaning they had to post $105 or $108 to get $100 in cash. The big problem with Lehman's activities in the repo market was that they used them the most at quarter end, to move assets off the balance sheet and show healthier capital levels. The illegal component is that they classified these asset moves as "permanent sales," which they were not. The chart below from the bankruptcy report shows how this balance sheet purge spiked at quarter-end levels, when Lehman wanted to "pretty-up" their balance sheet. This could of course happen only at quarter-end, because of the prohibitively high cost to do this. The report also goes on to conclude that these transactions served "No Business Purpose Other Than Balance Sheet Reduction."